I will be speaking at the American Federation of Astrologers conference in Tempe, Arizona from April 9-11 along with Benjamin Dykes, Demetra George, and Deborah Houlding. The theme of the conference is “cosmic clocks,” and I’m excited to be presenting lectures there on electional astrology and annual profections. For more information visit the AFA’s website at astrologers.com. I will be giving two talks at the Northwest Astrological Conference in Seattle from May 21-25, as well as a pre-conference workshop on timing peaks and transitions in one’s career and life direction using zodiacal releasing. My lectures at the conference will focus on interpreting the rulers of the houses, and tips for becoming a professional astrologer. For more info visit norwac.net. The event that I’m the most excited about this year is teaming up with the Organization for Professional Astrology (OPA) in order to present a three day intensive on how to time peak periods and transitions in a person’s career and life direction by using the Hellenistic time-lord technique called zodiacal releasing. This will take place at their annual Asilomar retreat in California from October 22-25, 2015. The OPA retreat is unique because we will have three full days to really get to the heart of this powerful technique and to show attendees how to use it an an effective way. The retreat will also offer a more intimate learning environment than usual since my group is limited to just 10 people for those three days, and we will be using each participant’s chart as an example in order to demonstrate how the technique works in the lives of actual people. The goal of the intensive is to do some high-level professional development training, and everyone will leave with a new set of skills to apply in their astrological practice. This will be my first time doing a full three day intensive on this technique, and I’m looking forward to sharing everything I’ve learned from using it with clients over the past 10 years. 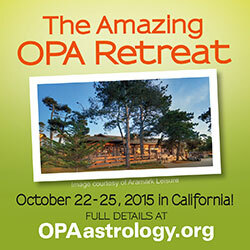 For more information about the retreat please see the retreat brochure or the description page on the OPA website at OpaAstrology.org.